Last year's The Sims 4 struggled to strike positive reaction from it's audience due to a lackluster and premature base game, but the series' semipermanent taste for expansion packs has given the latest instalment a shot at salvation. 'Get to work' is without doubt the first of many add-ons for the life simulator, and the unveiling of fully-fledged careers sets the game off on a path towards great potential. The expansion let's players follow their sims to work for the very first time as they become doctors, scientists and detectives. There's a ton of stuff on offer as each job has ten levels of advancement, specific locations to explore, and multifaceted goal sets to achieve. 'Get to Work' honestly feels as though it was made to address the fanbases problem about The Sims 4, most notably the lack of stuff to do and the aimless nature of life in the game. In addition to the three new careers, 'Get to Work' also gives players the opportunity to become their own boss, operating out of a lot in the Magnolia Promenade district. But that's not all you can do! We decided to list ten things in this expansion pack which we have enjoyed so far. 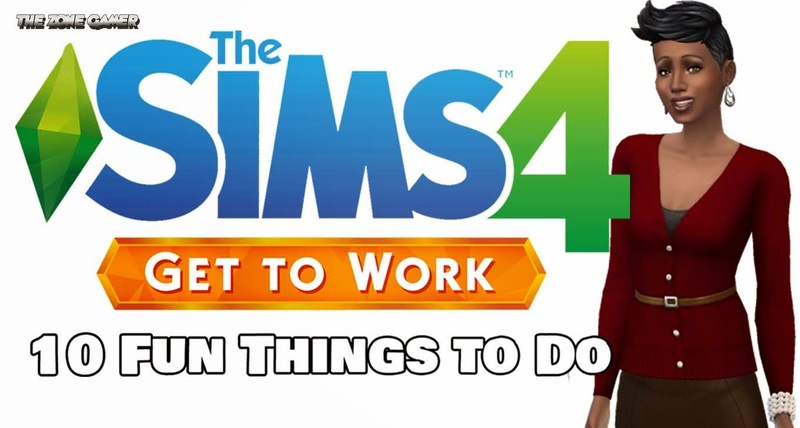 Here are a few of the of the things you can do in The Sims 4 Get to Work. I think the opposite of outdoor retreat. I've really enjoyed it and feel I got my money's worth. But I think they are definitely on the right track in correcting their mistakes for the sims 4. More content in packs for the same price, and the free monthly patches. Fantastic edition to the game. A step in the right direction, so much content! From what we can see, this is definitely proof of future expansions to come, with the way its going, I can truly see The Sims 4 being reshaped into a cult classic. This is the expansion pack everyone wanted! The world is a bit small but this is a great game. This is the grand sendoff for Maxis. I think this is the best expansion pack in the series. This EP is great, lots of things to do... It's basically everything TS3's Ambitions should have been... Open for Business was my favorite EP when I used to play TS2, and this one now remembered me that one... now TS4 feels more complete.